A black and white photograph of Larry Heffering and C.M. Rich standing by the cash register inside the B & A Service Station. 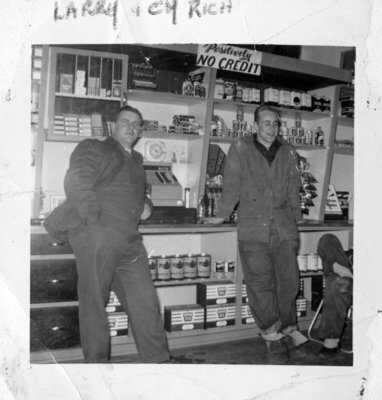 Larry Heffering owned the B & A Service Station located at the corner of Brock Street South and St. Lawrence Street in Whitby, Ontario. Heffering, Larry ; Rich, C.M. B & A Service Station, April 1955, Photographer Unknown. Whitby Archives A2013_038_003. Scanned from a black and white photograph.